Tiki décor and Polynesian-inspired cuisine at this unapologetically retro joint. : Formerly Sam’s Seafood and then Kona, Don the Beachcomber is a den of tiki kitsch and tropical cocktails in Huntington Beach. 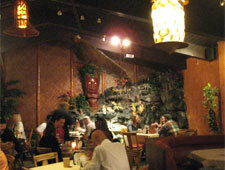 The original Donn Beach owned the first tiki bar in Beverly Hills and then a chain of Don the Beachcomber restaurants in Southern California and Hawaii. Beach passed away decades ago, but his rum-based cocktail recipes live on in this highly unique space, which features original tiki décor from the 1930s and a mid-century modern vibe that makes the regulars happy. Lots of folks drop by and gather in the High Chief's room to enjoy the big band, Polynesian and rockabilly acts that perform most nights, as well as the reggae music that fills the air each Sunday. Those who come here to eat and drink can expect rum cocktails and no-nonsense Polynesian-style fare, such as pulled kalua pork and baby-back ribs covered in a sticky ginger-barbecue sauce.